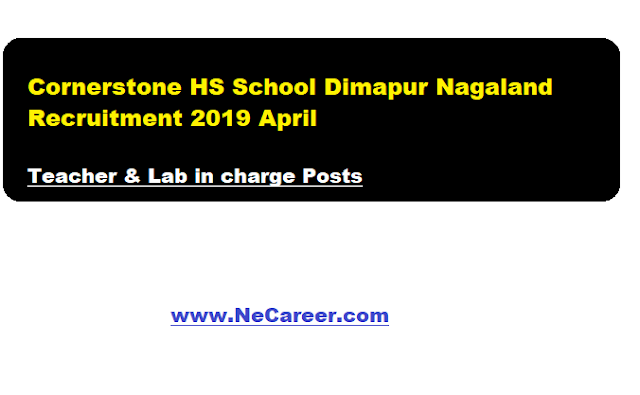 Cornerstone HS School Dimapur Nagaland Recruitment 2019 April | Teacher & Lab in charge Posts:- Welcome to North East India's No. 1 Job Portal NeCareer.com .Cornerstone HS School Dimapur Nagaland has published a job notification in April 2019 for various posts. Educational Qualification : Candidates must be M.A in English. Educational Qualification : Candidates must be B.E./Diploma in Electronics & Communications. Interested and eligible candidates are required to submit their applications along with the bio-data,copy of relevant documents, photo and contact details at Cornerstone Higher Secondary School , Duncan Basti, Dimapur Nagaland (9 AM -1:30 PM) on or before 15th April 2019. Applications can also be emailed to cornerstonedmp12@gmail.com. Only shortlisted candidate will be called for interview. Note : For Job 1 & 2 preference will be given to experienced candidates and also to candidates having B.Ed or D.El.Ed .